As a conductor, Jared had served as music director for several student ensembles and pit orchestras, including a production of Harold! the Musical at the Leonard Bernstein Festival of the Arts at Brandeis University, as well as a workshop production of Rachel. As a clarinetist, Jared has performed with the Columbia University Orchestra, The Secret Opera, Brandeis-Wellesley Orchestra, Boston Unhinged, and numerous chamber ensembles and pit orchestras. He also plays klezmer music with ‘Deiskeit. 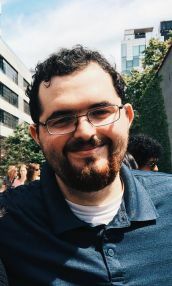 As a tenor, Jared has performed the roles of Monostatos and Kaspar in opera scenes, and sung with the Brandeis University Chorus and Chamber Choir and the Dudley House Singers. Jared was a corps member at City Year New Hampshire from 2011 to 2012, serving as a math and English tutor in a third grade classroom. While there, Jared conducted the school chorus and led them in rehearsals, created and taught after school classes on subjects ranging from music to science, and wrote a new school song. Jared has also worked as a counselor and domain guest at Beam Camp, where he created several week-long music programs for campers in which students performed works by John Cage, created their own pieces using invented notation, and collaborated on the production of an original opera. Jared is currently the Director of Middle School Music at Worcester Academy. Rachel Dean (Music Director) is a composer, pianist, and music director originally from Iowa. An ASCAP award recipient, she is a graduate of NYU’s Graduate Musical Theatre Writing Program and works as a rehearsal pianist for Hamilton. Her musicals include: Medusa (with Wes Braver), The Anxiety Project (with David Brush), and The Ballad of Janis Matthews and the Dodo Scouts (with Giancarlo Rodaz). Michelle O'Brien (Assistant Director) is a director, writer, and performer based in Brooklyn. Directing credits include Park Plays (Queens Theatre), work with NY Madness & Theatre 167 (Mate by Jessica Moss, Engorged Alien Entropy by Joshua Young), Love Drunk (Sightseeing by Elena V. Levenson), and The 24 Hour Plays: Nationals. AD: F#%king Up Everything off-Bway, dir. Jen Wineman. She’s also an improviser and sketch comedy writer, but try not to hold it against her. B.A., Vassar College. Lauren Jackson (Stage Manager) is a recent graduate from Syracuse University with a BFA in Stage Management. 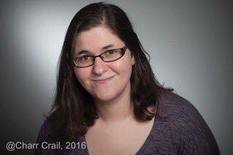 Most recent Stage management credits include: Singing Beach (Theater 167), Ends of the Earth (InViolet Theater), Major Barbara (Syracuse Drama) and Ragtime (Redhouse Arts Center) as well as Production Intern at The Secret City. Lauren was also a Stage Manager Intern on the Broadway musical In Transit. 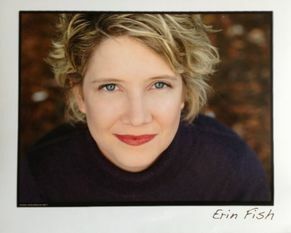 Erin Fish (Rachel Carson) is excited to tell this wonderful story again! New York: Rachel (Fresh Fruit Festival), Danton’s Death and The Flood (Prospect Theatre Company). National tours: Mamma Mia! (Donna), Annie (Miss Hannigan). Favorite Regional: 9 to 5 The Musical (Violet), Dirty Rotten Scoundrels (Muriel), The Taffetas (Kaye, Fulton Theatre), The Last Five Years (Catherine, Winter Park Playhouse), The Full Monty (Vicki, TBTS), The Producers (Ulla), Singing in the Rain (Lina), Anything Goes (Reno), Guys and Dolls (Adelaide), Nunsense (Amnesia), South Pacific (Nellie), H2$ (Hedy), Hairspray (Velma, Mill Mountain), Pirates of Penzance (Kate, Fulton Theatre), Laughter on the 23 rd Floor (Helen, OSTC), Rumors (Chris), Always Patsy Cline (Patsy), and Beauty and the Beast (Wardrobe, Actor’s Playhouse). Thanks to Jessie, Jared and Ari for this amazing adventure! To Tyler, Life is Good! @ErinLFish. Rebecca Muller (Young Rachel Carson) is thrilled to be a part of the Rachel team! She is a graduate of the University of Miami, originally from Lincolnshire, IL. Favorite past roles include Miss Adelaide (Guys & Dolls), Rona Lisa Peretti (Spelling Bee), and Anna (Burn This). She would like to thank her parents, family, and friends for their incredible love and support. For Ellie. Amie Bermowitz (Dorothy Freeman and others): Most recently, Amie was seen in the off-Broadway show, RUTHLESS! THE MUSICAL. Also off-Broadway, she has performed in 3 shows with Musicals Tonight: MEXICAN HAYRIDE, WHOOPEE!, and, PARDON MY ENGLISH. Other NY credits include THE HUMAN COMEDY at APAC and several NY Fringe shows. Regional highlights include BOOKENDS (world premiere), at NJ REP; DANNY AND SYLVIA, The Forum, NJ; Sally in CABARET, PINS AND NEEDLES, and A FUNNY THING HAPPENED...FORUM at The Washington Jewish Theatre, MD; THE BROTHERS KARAMAZOV at Arena Stage, DC; TINTYPES at Round House Theatre, MD. Amie also sailed the Caribbean playing Cinderella's stepmother, and Cruella DeVil in the main stage productions aboard Disney Cruise Line. Happy to be part of the lovely musical, RACHEL. Max Bitar (Off-Stage Voices) ​is ecstatic to be joining the Field siblings again for their powerful, original musical Rachel. He last appeared in their original musical La Maupin as part of the 2017 Fresh Fruit Festival. Since his recent graduation from UNC Chapel Hill’s theater program, he has performed in festivals at The New Ohio, The Wild Project, and INTAR Theatre in New York, and worked regionally at PlayMakers Repertory Company, Deep Dish Theatre Co., Kenan Theatre Company, and Lab! Theatre. Big love to mom and dad, Jessie and Jared, and the incredible friends/artists/collaborators he has been lucky enough to meet in life so far. J. Stephen Brantley (Off-Stage Voices): Off-Broadway: Mope (Ensemble Studio Theatre), Murder In The First (59E59), Pirira (Theatre 167). Regional: The Night Alive (Guild Hall), Of Mice And Men (Bay Street), and Romeo And Juliet with its zombie sequel R & J & Z at Stonington Opera House. TV: “The Blacklist” (NBC), “Neon Joe, Werewolf Hunter” (Adult Swim), “Difficult People” (Hulu). Brantley has also worked with Big Dance Theatre, Blessed Unrest, CapsLock, and Jewish Plays Project, and at venues including Queens Theatre, LaMaMa, Metropolitan Playhouse, The New Ohio, P.S.122, and Soho Rep. He is a graduate of NYU’s Experimental Theatre Wing, an eight-time New York Innovative Theatre Award nominee, and winner of the Micheál MacLiammóir Award for Best Actor at the 2013 Dublin International Gay Theatre Festival. J.Stephen is the Producing Artistic Director of Hard Sparks and a member of the Indie Theatre Hall Of Fame.